Are you thinking about childcare options for your family? Whether you have a baby and are thinking about the return to work, are looking for a preschool service for your toddler, or afterschool childcare, here you will find more information about the types of childcare available, and some tips around finding the right early years service to meet the needs of your family. You can also find our comprehensive list of all registered childcare services in Kilkenny. Early childhood service or childcare service is a broad term which refers to any childcare service which your child may attend including – crèche, nursery, day care, preschool, playgroup, montessori etc. Most Full day care services will cater for children in each of these categories, however many preschool services only operate for sessional ECCE. Deciding on the early years service which is right for your family is a big decision, so you should find out as much about the service as possible before enrolling your child. Ring and enquire about their vacancies, opening hours, and whether this might suit your childcare needs. Arrange to visit and meet the manager and staff members who could be working with your child or children, ask about the values of the service, and how this may fit with your approach to parenting, visit the indoor and outdoor spaces which your child will be able to access. Ask about what curriculum approach they use to learning and development in the setting, ask about the strategies they use for fostering positive interactions, and how they can support your child to settle in to the service. This guide to choosing a childcare services from Barnardos has a more in-depth section on what you might consider when selecting the early years service to suit your family. 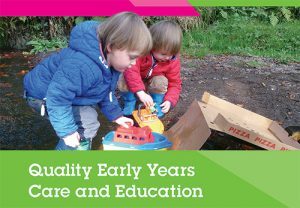 View Barnardos Choosing Quality Childcare e-book here. Siolta is the quality framework for early childhood care and education and outlines principles of quality, along with standards and components for their implementation in early years settings. This covers a broad array of aspects from Interactions and Play, to Parental Involvement and Curriculum. The Siolta website covers information around the framework in depth. Aistear is the Early Childhood Curriculum Framework for children in Ireland aged birth to six years, and it is used in early years settings and primary schools. Aistear views the child as a competent and confident learner, and maps the childs learning and development through themes of communication, well-being, exploring and thinking, and identity and belonging. The Aistear website provides information and tip-sheets which can also be used by parents.